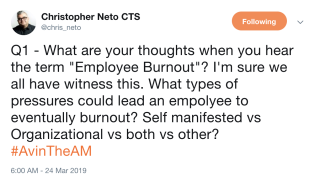 In this week's #AVintheAM, Chris Neto asked "What are your thoughts on the term 'employee burnout'? What types of pressures could lead an employee to eventually burnout?" I believe that burnout ultimately comes down to yourself. You can only do as much as time allows. Don't put yourself under unnecessary pressure by making false promises. If pressure is coming from above, and the boss won't listen, then do you really want to work there? I experienced this, and I can look back now and honestly say my burnout was a combination of the company and my own decisions. I take ownership of the fact that I couldn't say no, that I didn't ask for help in a clear and concise way, and that I also needed control and didn't delegate. There's also various forms of burnout—whether that be physical, mental, or both. It's harder to prevent physical burnout in my humble opinion. Mental pressures can, in some forms, be managed provided employees speak out. When you call them (and hence treat them as) employees, they will eventually burn out. We don’t have employees, we have team members. I've seen burnout happen—for the most part—due to bad or unqualified managers/supervisors. When work stops being fun, and/or when you add to the mix personal/family issues/pressures that become intolerable, employees can stop being effective, and stop caring. One pattern in the employees under stress is a missing personal space boundary. They answer calls at all hours, skip vacations, or accept chaos as normal—the need to be the hero or the martyr is destructive. Even Superman became Clark Kent, if only for a while. It can be many ways, the classic being overwork. It's easy for an organization to focus on being "lean" and having everyone at 110-percent capacity—that's great for the bottom line in the short term. Long term, people won't work 110-percent forever. They can't. For more thoughts on the topic of employee burnout, read the full Twitter thread here.